Remember reprints? Sent out to interested researchers. 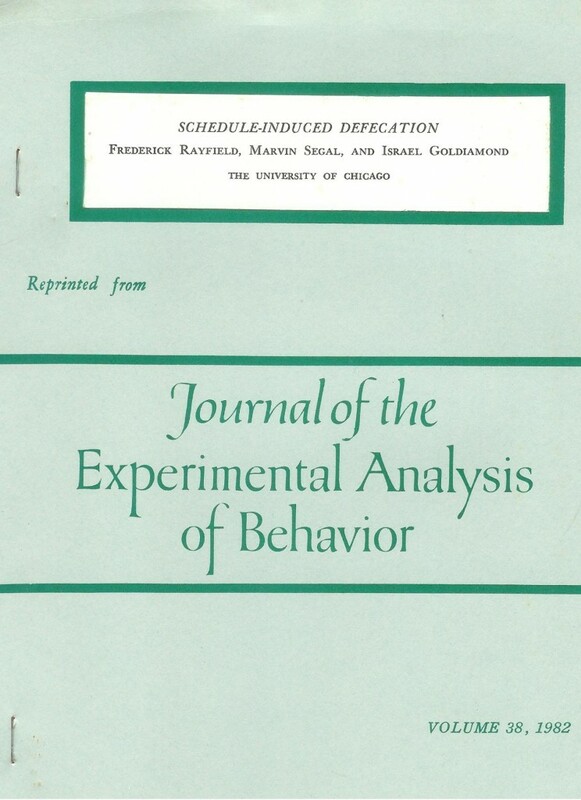 My 1980 doctoral dissertation, Schedule-induced defecation in the rat, was published in JEAB with my doctoral advisor and his research associate as co-authors. I discovered that rats on fixed interval schedules of reinforcement not only defecated in excess, but had diarrhea. The more food, the less defecation. It was demonstrated with water reinforcers, and with free presentations of the food pellets. On continuous reinforcement or ratio schedules, little or not defecation was observed. The defecation was robust, and easily controlled using the schedules described, and long-lasting. Since defecation in rats had long been considered a sign of emotionality, this suggested varied emotional reactions to the common schedules of reinforcement used in behavior analysis. It suggested a model for human gastrointestinal reactions to environmental situations, including irritable bowel syndrome. Subsequent research in my lab at Roosevelt University, and by other researchers, has left us still puzzled by this, just as schedule-induced polydipsia seems biologically maladaptive and puzzling. However, I have data showing that a larger reinforcer can prevent the defecation, as can prior experience with ratio schedules. And a variety of drugs which usually control the defecation have no effect. I will post a preprint when ready, and later a reprint, or whatever we call them now. With a fifty cent transistor I built a $200 counter from a $10 calculator. Rayfield, F. and Carney, J. A number of inexpensive early microcomputers- Apple, Rockwell, Commodore, Ohio, Amiga, Atari and others used the 6502 microprocessor family. The Apple II took the educational world by storm. A popular platform for years. Rayfield F., Segal, M., Goldiamond, I.
Costill D.L., Rayfield R., Kirwan J., Thomas R.
Costill ran a research mill. He had a staff that turned questions and ideas into publishable data in just weeks. He had me convert my VO2 max system, which he had purchased, to measure swim force. He slapped my name on the paper as second author and had it accepted for publication before I could suggest changes. My article in Bicycling magazine, How to Avoid Bike Muggers, was reprinted as a chapter in Bicycling Commuting (Rodale Press 1980). My unpublished research includes work in academic settings and proprietary clients. VO2 MAX: My Rayfield Equipment VO2 max measurement system was the standard for research labs from 1980 to 1990, and was installed from Alabama to Yale, with Panama, Argentina, Italy, MIT, LSU, Tibet, Tennessee, Wayne State, Ball State, the Olympic Training Center, and Northeastern Illinois University where I started it with Dr George Lesmes. By 1990, grad students could build the systems themselves, and did, modifying my open source software. An internet search of Rayfield and VO2 gives me a sense of doing good in the field of exercise physiology and cardiac rehabilitation. My 15 minutes of fame. Behavior Control: After nursing its Apple II based system for a decade, I replicated a four station human operant lab on a PC-based LAN for the UVM Human Behavioral Pharmacology Lab (Bickel and Hughes). Bickel then promptly moved the lab across country, without hitches, and then moved again a few years later, without hitches. I still give them a hand. I use the gut code for that system for student demonstrations when I teach behavior analysis. Sensory Systems: My first academic presentation was as fourth author on a APA Annual meeting paper, working as a behavior and neurosurgery tech looking at visual system plasticity in cats, rabbits, and squirrel monkeys. E Hazel Murphy at the University of Chicago was my employer, teacher, and PI on the 1973 paper. I have recently worked for a private international client studying sensory systems using operant methods. I developed both equipment appropriate for the species and consulted on research design. Early ABAI: Before ABAI was ABA, it was founded as the Midwest Association for Behavior Analysis. I was a student at the organizational meeting in Chicago, and the first ten or so annual meetings. I presented workshops on setting up operant equipment on a budget, and my rat defecation data and other behavior research. and other pulmonary diseases is objective evaluation of whether airways are in fact improved by therapies. By analysing the stream of single exhaled breath which was inhaled as a mixture of 5% helium and 5% sulfur hexafluoride, and looking at the washout of those two gases in the breath with a mass spectrometer, we can see changes in the openness of the lung airways. I built the gas-switching valves and breathing chamber, the electronics to pull data in from the mass spectrometer and the flowmeter, and wrote software to calibrate and then conduct the data collection, with instant display of best-fit slopes in operator controlled ranges. The client was able to hand the system over to local programmers for changes as needed for various research and treatment protocols. Autism: I learned a lot about autism skiing with Ivar Lovaas. Matt Israel brought me into his school for severely autistic, self-injurious kids in Providence, Rhode Island.. While 90% of his interventions were positive reinforcement, he was using punishment to decrease self-injury which was life-threatening. He wanted me to suggest methods of punishment which would be more socially acceptable. The best one grew out of a puff of air to the face- something most people and animals find aversive, but few parents or social workers would find objectionable. When I returned to the school to see if the air compressor and air guard were effective, I found they had not been used. It turned out that the threat of using the long rubber hose that hissed, attached to the machine that randomly turned on and rattled and hummed, and hissed, was so effective that the staff did not want to risk losing it by employing it as intended. No publication, no big fee. Interesting work if you can get it. Matt was strongly focused on treatment modalities and less interested in publishing research results, so we never put these projects together for publication. But this work in a field dominated with an emphasis on reinforcement sparked my interest in developing my course on fear. Walden Two: The B F Skinner Foundation had converted the cassette tapes of Skinner himself reading Walden Two into a digital disc. But they needed copies made, and they wanted a package of some sort. I designed a clamshell case, obtained and registered an ISBN and applied a barcode, and printed and burned the discs. It was good to own a book shop- that’s why they called me. It was good to pay back to the source. Utterances in therapy: In college I needed a junior paper for my interdisciplinary program. I was working in Goldiamond’s stuttering clinic at the University of Chicago. We were interested in objective measures of what happens in therapy. I set up some equipment to measure the number and length of speech segments, or utterances, by the therapist and the client, taped in representative client-centered and behavior therapy sessions. I basically replicated Joseph Matarazzo’s award-winning research with a different slice of therapies. Not enough data to publish. In a nutshell, in the behavior therapy tapes available the vocal interactions were shorter and more frequent compared to client-centered therapy tapes. Heroin and polydrug therapy: I was one of many acknowledgments on Goldiamond’s paper at the annual APA meeting describing our work doing constructional behavior therapy with inner city heroin and polydrug users. Research assistant- we learned about withdrawal symptoms, the ecology of heroin use, methadone maintenance, and the very different range of reinforcers in ghetto drug life. And we encountered some human mysteries. Combined with my lack of knack for doing weight control and gender adjustment therapy at the Behavior Analysis Research Laboratory, I moved my career from clinical to teaching and research opportunities.